My hubby and I were rather shocked last night when our kids went off to bed so early! We should have known somthing was up. As you can see boxes make wonderful toys. 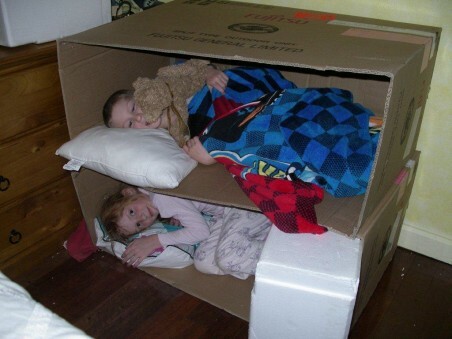 We had two aircons installed and the big empty boxes left behind were snapped up by the kids. It kept them so busy playing games…excitement plus…I could hear their raised voices from the back yard. I’m not sure which one came up with the idea of the bunk beds…but we did have a laugh. I had an up hill battle trying to convince them their beds would be more comfortable!! These boxes are the most played with things in our house. Wonderful to let them go free with their imaginations and not have some expensive toy. I wonder what they will be turned into next, when they get home from school? Blake went to be with tears as his box bottom fell open and I had to promise him that today i would get some big strong tape and fix it up again. Sheesh, if only life was that easy!! 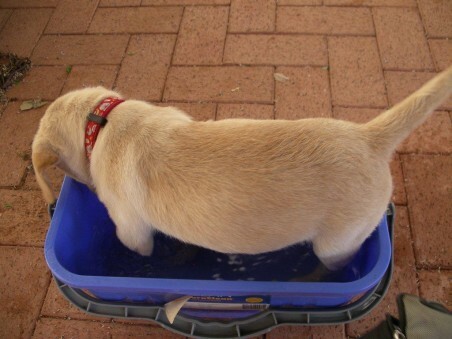 Mac took this pic of Sally, who had jumped in the water bucket to cool off. She’s in for a shock as summers only just started!